3 words. Holiday Valley Resort. After the huge snow storm hit on Friday, I made my way out to Holiday Valley on a beautiful Sunday afternoon. After living in Western NY for the past 3.5 years all I ever heard was how great Holiday Valley was, and let me tell you, it lived up to the hype. The two feet of snow that dropped was definitely a help for conditions, people were tearing up the trees, chasing all the fresh powder that could be found, and there was a lot. The smiling faces of skiers and riders were as bright as the sun that was shining all over the slopes. Holiday Valley has a family vibe, families young and old, skiing, riding or resting in the lodge. It was a warm and welcoming atmosphere with happy skiers and riders. I had the privilege of taking a few runs with Marketing Director, Jane, who showed me the mountain and some of her favorite spots. Jane has been with Holiday Valley for 37 years so she knows a lot about the mountain. I asked her what her favorite part of Holiday Valley was, she said “I love how the sport of skiing brings so many generations together.” Her nephew had just visited the mountain and was teaching his children to ski. I totally understand that, my whole family skis together, it is just something we all do! No matter what my favorite ski buddy is my dad. Jane also enjoys how Holiday Valley is a family oriented resort. The slopes are family friendly as well as the lodging with a pool at the Inn at Holiday Valley, children and families are always busy. Beginners crowded the learning area, anxious and excited to get their start in the sport. At Holiday Valley even the beginner lift is a 4 person chair, so that right from the start you are skiing with the experts! 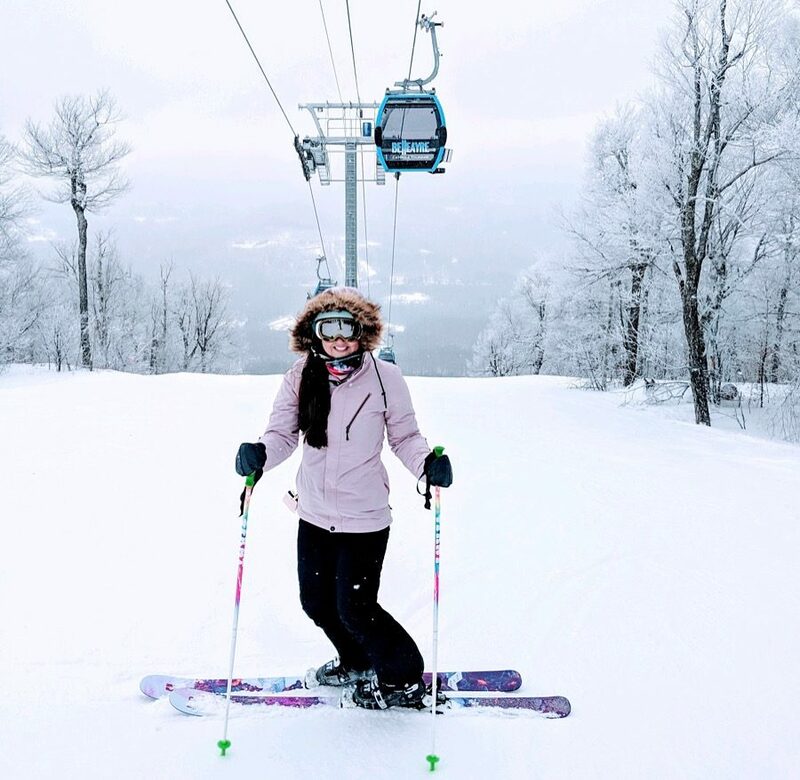 There are a variety of slopes offered at Holiday Valley, many blue and green trails with spectacular views, and a few black diamonds. As an expert skier I love to ski all over the mountain and go where it takes me. This time it took me to my favorite part of the mountain, the Tannenbaum Express Quad. This quad lift cuts right through the trees creating the most beautiful view. When you unload the lift you are surrounded by huge trees. In that moment I was mesmerized by nature, all I could do was keep looking up at all the trees. Getting off the lift and going to the right you find yourself going down trails with these huge trees towering over you. You really feel like you are tree skiing! I could not stop skiing in this area of the mountain; I fell in love with it. The friendly employees at Holiday Valley made my whole experience welcoming, from purchasing my lift ticket, loading the lift, buying my lunch and asking the safety staff to take a photo. It was a great happening all around. If you’re a first time season pass buyer, you can go buy a pass for the 2018-2019 season right now and you can use it the rest of this season! What a deal! Go grab your season pass today and ski the great conditions! Thanks for having me Holiday Valley!